After the all-white dress code of Wimbledon, comes the colourful US Open. The players go out of their way to stand out in bright hues. Be it Laura Robson’s ‘Ultra Bright’ skirt or Venus Williams’s neon hair, there is a loud splash of colour all around Flushing Meadows. Which of those players scored an ace in the style department? Who flopped? The former world No 1 sported a Stella McCartney cut-out dress. In various shades of blue by Adidas she did not make a pretty picture; we have seen this Dane more impressive earlier. Take a look at the slides and let us know what YOU think of their styles by using the poll at the bottom of each page! This Canadian beauty stepped into Maria Sharapova’s signature dress by Nike. But the mishmash blue-grey, we think, did not go well with this pretty lady. Take a look and let us know what YOU think of their styles by using the poll at the bottom of each page! After the attention-grabbing and impossible-to-ignore neon colours at the US Open, this blue outfit by Camila Giorgi of Italy soothed the eyes. The world No 1 pulls this one off with ease. 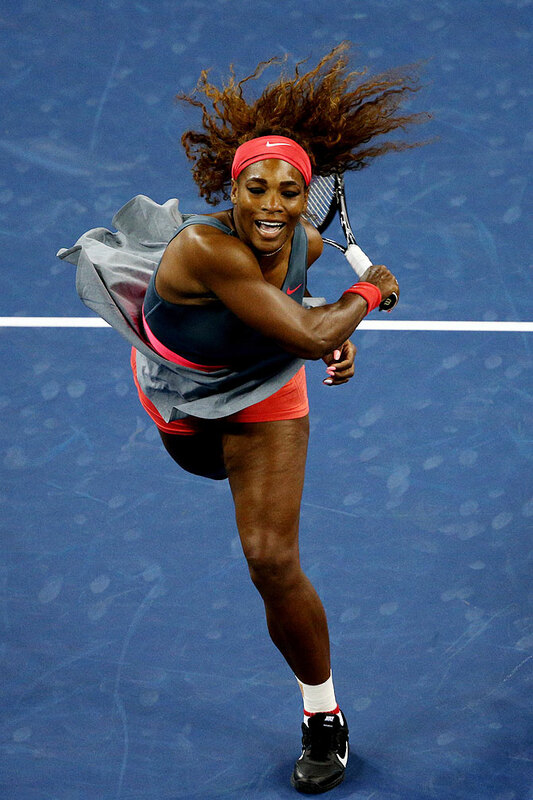 After a lot of trails, Serena got this one right; the dress compliments her better. The shade of bluish-grey, cinched by a vibrant coral waistband accentuates her curves. Venus Williams continues to dominate centre court with her incredible dresses from her own brand EleVen. She sported a floral dress and matching purple hair at the US Open. It was hard to concentrate on tennis as Venus had a lot of bling in her finger nails too. This Polish beauty deserves something better! She is sporting the same Lotto sleeveless deep-purple dress with muted coral highlights for quite a while. The US Open permits players to exhibit a little flair, but Li Na seems to prefer the basics. She is her sporty best and knows what flatters her figure. This tie-dyed style shirt and school-girl skirt looks fun and hep on this lady in her 30s. This Brit was color-coordinated from head to toe in her ‘neon orange’ skirt, headscarf and shoes. Surely, a fresh and refreshing combination. 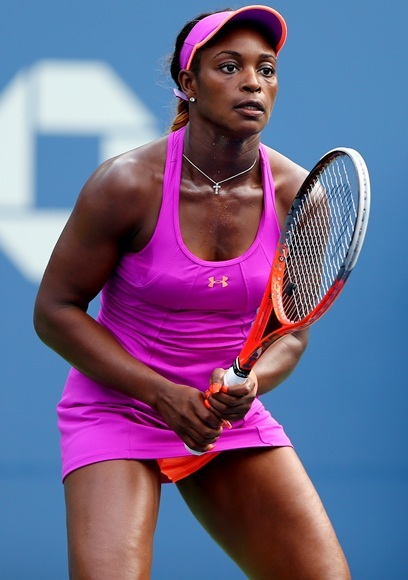 Sloane Stephens makes fuchsia and bright orange work. The dress photographs well and sure helped he cause! The in-form Victoria Azarenka appeared in an unflattering number from Nike. 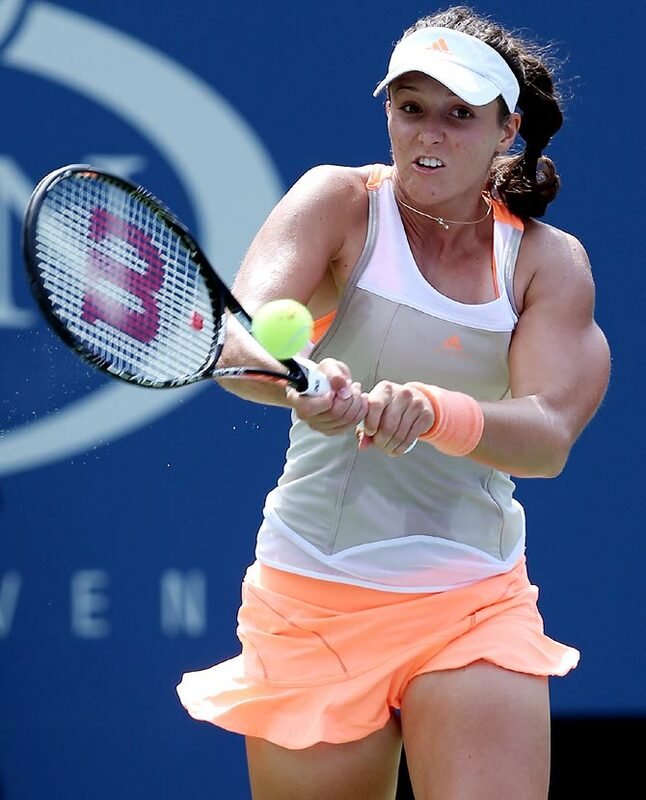 Azarenka's pale coral tank-and-white-banded gray vest makes one of the fittest players look sluggish. Ana Ivanovic and Daniela Hantuchova’s sport identical bright-red Adidas dresses and does not have drama to it. Both deserve better. With so many ladies wearing pale colours, Svetlana Kuznetsova added a lot of bright hues but it did not help her cause. Are you a die-hard football FAN? Guess who this player is! Will Bale's family girl be limelight hogging WAG?